AIDS — the scourge of the 21st century — carries with its assault fear, judgment of people’s morality and strong prejudices. Thus, many people questioned our wisdom in allowing our daughter to serve in Uganda. In addition to the health risks, would encountering a region where more than 200,000 children have lost both parents to AIDS inflict on her a heavier emotional weight than her teenage shoulders should be asked to carry? Our daughter safely returned; however, she will never be the same, and we’re grateful! The omnipresence of sorrow was overwhelming. She entered countless homes in which the head of household was under 14. We were concerned about the emotional weight she would bear, but compare that to young teenagers living as the sole providers for their siblings — attending school by day, tending crops and younger brothers and sisters by night! Most elderly in Uganda have taken into their homes 10 or 12 little children who do not have the gift of a 14-year-old “man” older brother to care for them. Often unrelated, they live together in a common bond of kindness. Though families are shattered by this disease, communities are strengthened by compassion. Our daughter couldn’t help but reflect on the contrast with our own life in the United States, where we are protected from such suffering. She, like many Seattle Pacific University students who have worked with AIDS patients in South Africa through the SPRINT program, feels Americans are impoverished by our lack of community and by a collapse of kindness. In our country, an HIV-positive child has been considered too great a risk to be allowed into a Sunday school class. Quite a contrast to Uganda. People are seldom even tested for HIV there. It’s a tragic assumption of life. While in Uganda, our daughter had the unexpected opportunity to visit the child we sponsor through World Vision. Annet’s father died from AIDS when she was 6 months old, her mother when she was 2. She now lives with her grandmother, who cares for seven orphans, the children of her sons, all of whom died of AIDS. Because her mother was dying when Annet was born, she was not breast-fed and experienced very poor nutrition. Therefore, her physical growth and mental development are impaired. World Vision has provided her with high-protein supplements and supported her in school. They’ve also provided the grandmother with goats and seeds to enhance her income. Annet’s eyes bear the mark of her sorrow, yet the home in which she lives is flooded with light. Like most of the children in her region, and millions of children in the world born to an HIV-infected mother, she too is probably carrying the internal ticking time bomb of HIV. Yet Annet is discovering signs of God’s faithfulness that surpass the sorrow of her circumstances. She is encountering the God who says to us, “I know the plans that I have for you … plans for your welfare and not for harm, to give you a future with hope” ( Jer. 29:11). True for us here in the United States. True for people with AIDS. True for the AIDS orphans of the world. Thanks to the work of the Ugandan government, the church and non-governmental organizations such asWorld Vision, HIV/AIDS education efforts have had a positive impact in Uganda. It’s one of the few countries in Africa that has actually experienced a decrease in the incidence of infection. I ’m proud to be the father of an AIDS orphan. Our Lord has said to us, “Let the little children come to me, and do not stop them; for it is to such as these that the kingdom of heaven belongs” (Matt. 19:14). May God grant to us the same spirit as the disease-decimated and joy-enriched church of Uganda to extend the embrace of the One who is the heavenly Father of all AIDS orphans. 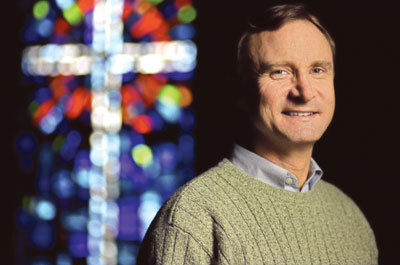 Tim Dearborn is dean of the chapel at Seattle Pacific University. This essay was adapted from one Dearborn originally wrote for the November 17, 1997, edition of Christianity Today.